What Types of Hearing Aid are Available Nowadays? Home > Hearing > What Types of Hearing Aid are Available Nowadays? Hearing aids are devices created to help those whom have lost some degree of hearing ability. Traditional types of hearing aid were often limited to those large brown pieces of equipment that were worn behind the person’s ear and were uncomfortable and unsightly. Fortunately, technology has allowed experts to develop new types that are designed especially due to the nature of the hearing loss and are fitted principally for the person by which it is to be worn.Hearing aids can be either analogue or more popularly now digital, and work depending on the person’s hearing ability and on the needs of the individual person. These aids, work by converting sound waves into electrical signals that are them amplified and directed into the ear. Digital hearing aids process sound and convert it into computer language via a small chip. These sounds are understood and converted into patterns that can be tailored to the individuals needs. They are very useful in altering specific problems that each individual may have. There are still 'behind the ear' hearing aids available, though these have now been designed much more discreetly and can be found using clear materials, making them a lot less unpleasant. 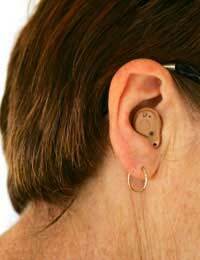 These types have a small device that rests behind the ear with a connecting tube that runs to a mould earpiece that sits in the ear itself. These are often digital these days, and new designs have even abolished the need for an ear mould if hearing loss is minor, using only the behind the ear component, shorter connecting tube and soft ear piece that does not go directly into the ear. Another type of hearing aid is one known as an 'in the ear' device. This type involves the whole piece of equipment being worn in the ear as this is where is working mechanisms are to be found. Although they are less reliable than the behind the ear type, they are more discreet and cannot always be seen by other people.Those with small ear canals from conditions such as, abnormalities like bone development from birth, may not be able to use these devices or have the same degree of choice as they will not fit properly, therefore will not function as effectively as they should.Those with severe hearing loss may also be restricted in the amount of options available to them concerning this choice of hearing aid. Those, who suffer from conductive hearing loss, when the sound waves cannot transmit effectively through the different chambers of the ear, will normally benefit from a 'bone conductive' hearing aid. This piece of equipment attaches to the head via a headband usually, allowing for sound transmission to bypass the outer and middle ear and be sent directly to the inner ear via vibration sent through the skull.More modern varieties of this type of device include implants that are inserted into the area of the skull in which the sound waves need to be transmitted, but this is a more invasive procedure and is permanent. Body worn hearing aids are larger devices and more suited to those who have difficulties with fine motor movements or handling very small switches or dials. This equipment is worn as a power pack somewhere in or around the body and connects to the ear via a cable and an ear piece. Hearing aids are fantastic inventions that are being updated and modernised all the time in order to make them easier to use, better quality and more discreet for the user. They can significantly improve the quality of someone’s life, and should always be recommended and fitted by a trained professional in order to achieve the best result for your individual needs.